The MNF-I replaced the previous force, Combined Joint Task Force 7, on 15 May 2004, and was later itself reorganized into its successor, United States Forces – Iraq, on 1 January 2010. The Force was significantly reinforced during the Iraq War troop surge of 2007. As of May 2011, all non-U.S. coalition members had withdrawn from Iraq, with the U.S. military withdrawing from the country on December 18, 2011, thus, bringing about an end to the Iraq War. Also in Iraq, since August 2003, is the United Nations Assistance Mission in Iraq, which does humanitarian work and has a number of guards and military observers. The U.N. Assistance Mission in Iraq was not a part of the MNF-I, but a separate entity. The NATO Training Mission – Iraq, was in Iraq from 2004 to December 2011, where it trained the Iraqi Army and the Iraqi police forces. The news media in the United States generally used the term "U.S.-led coalition" to describe Multi-National Force – Iraq, as the vast majority of military forces in MNF-I were contributed from the United States. The majority of countries that deployed military forces to Iraq as part of the MNF-I generally confined them to their respective military installations, due to widespread violence throughout the country. The MNF under unified command is prepared to continue to contribute to the maintenance of security in Iraq, including by preventing and deterring terrorism and protecting the territory of Iraq. The goal of the MNF will be to help the Iraqi people to complete the political transition and will permit the United Nations and the international community to work to facilitate Iraq's reconstruction. The government of Iraq enjoyed broad international recognition, including from constituent countries of the Arab League. Jordan assisted in training of Iraqi security forces, and the United Arab Emirates donated military equipment, though purchased from Switzerland. As of September 2008, over 545,000 Iraqi security forces have been trained. In November 2006, the United Nations Security Council voted to extend the mandate of the multinational force in Iraq until the end of 2007. The move was requested by the Iraqi government, which said the troops were needed for another year while it built up its own security forces. In December 2007, the Security Council unanimously approved resolution 1790, which extended the mandate until December 31, 2008. In December 2008, the American and Iraqi governments signed the U.S.–Iraq Status of Forces Agreement, which covered only American troops. It allowed them to remain in the country until 2011, but changed the status on several issues. Iraq regains sovereignty of its airspace, gains sovereignty over American contractors U.S. forces who commit crimes, if they are both off-duty and off base. The U.S. were given until July 31, 2009 to withdraw from Iraqi cities and the whole agreement was subject to a referendum of Iraqi voters held prior to June 30, 2009. If the referendum failed to approve the agreement, the Iraqi government would have given the U.S. until July 31, 2010 to withdraw completely. On December 18, 2008 the Iraqi government published a law that covered the status of non-U.S. foreign forces in the country from the end of the U.N.'s mandate on December 31, 2008 through to their withdrawal on July 31, 2009. The Iraqi parliament voted on Saturday December 20, 2008, after a second reading of this law, to reject it and send it back to the Iraqi cabinet. The majority of Iraqi parliamentarians wanted it to be made into a binding international agreement rather than simply presenting it as a local Iraqi law. A compromise was reached and the law passed on December 23, 2008, with the Iraqi government agreeing to then sign bilateral agreements with the affected countries. United Kingdom – 3,700 troops were in Southern Iraq, leading the Multi-National Division (South East), which includes troops from several other countries. The deployment includes infantry, mechanized infantry and armored units as well as water-borne patrol personnel and a range of aircraft. After the invasion (which involved 46,000 British troops), approximately 8,500 troops were stationed in the south of the country, but 1,300 were withdrawn in early 2006. The British government then gradually reduced the number of troops in Iraq  until May 22, 2011 when all the remaining British troops left Iraq after the Iraqi government rejected their request to stay and to extend their mission. The UK has lost 179 soldiers in Iraq as of 12 February 2009: 136 in roadside bombings, firefights, and rocket attacks. Out of the remaining 43, the cause of death included accidents, 'friendly fire' incidents, illnesses, and suicide. See Operation Telic for further information. United States – In the cities, U.S. forces operate in support of Iraqi forces, and outside the cities U.S. forces operate in partnership with Iraqi forces. Support includes, for example, aerial surveillance, tactical advice, logistics, and intelligence, while partnership includes actual combat, for example patrolling, mine clearing, and serving arrest warrants. Additionally, a major line of operations is the logistical work of transporting millions of pieces of equipment back to the United States. On 1 January 2010 the five major command groups in the country were consolidated into a headquarters command called U.S. Forces – Iraq (USF–I), and MNF–I was deactivated. Subordinate commands (MNC–I, MNSTC–I, and Task Force 134), responsible for detainee operations, were also deactivated in the same ceremony and their responsibilities now fall under the aegis of USF–I. In August 2010 all U.S. combat operations in Iraq ceased, and by then it is planned that all combat brigades will be AABs. In accordance with the U.S.–Iraq Status of Forces Agreement, all U.S. troops were withdrawn from Iraq by December 31, 2011. On October 21, 2011, President Barack Obama confirmed that all U.S. military personnel would leave Iraq by the end of 2011. As of December 6, 2011 there were 4,485 American soldiers killed in combat operations within Iraq. On December 15, 2011, the United States formally ended its mission in Iraq. On December 18, 2011, the United States completed its withdrawal from Iraq. El Salvador – Salvadoran troops were involved in guarding convoys. The last Salvadoran troops left Iraq on January 22. El Salvador lost five soldiers in Iraq, four in hostile incidents and one in an accident. Twenty soldiers were wounded. Estonia – Estonia has decided not to send a fresh troop contingent to Iraq, ending the involvement of units of up to 40 soldiers in the mission in Iraq since June 2003, Estonia's defence ministry announced in January. The mission officially ended on February 7, 2009. Their task was to conduct raids and combat patrols alongside American Forces in Baghdad and Fallujah. Two soldiers were killed in Iraq in separate insurgent attacks, 18 soldiers were wounded. Three staff officers remain with the NATO-led training mission in Iraq. Romania – Romania had originally had 730 soldiers (400 infantry, 100 military police, 150 de-miners, 50 intelligence officers, and 30 medics) deployed in Iraq. At its peak, it operated in three different zones (South-East, Central, and Baghdad). They performed a wide range of missions—prisoner interrogation at Camp Cropper and Camp Bucca in the American sector, reconnaissance and surveillance missions (Often involving Romanian Air Force RQ-7 Shadow UAVs) in the Polish sector, and training, peacekeeping missions, and base protection missions in the British sector. Romania also temporarily deployed a force of 130 soldiers to support UNAMI, a Coalition force in Iraq working under the authority of the United Nations. The force was deployed in March 2005, and withdrawn after six months. Romania reduced it, first to 501 by November 2008, and by early 2009, Romania had reduced its contingent to 350. They were stationed in Nasiriyah and Al-Kut. In an agreement signed with Iraqi Defense Minister Abdul Qader al-Ubeidi and the Romanian ambassador, Romania promised to withdraw its troops on July 31, 2009. It had been previously announced on November 6, 2008 that Romania would withdraw its then 501-strong contingent by the end of the year and leave a small group of advisers to assist the Iraqi authorities. In 2008, the president announced that the troops would stay until 2011. However, under the terms of the SOFA agreement between the United States and Iraq, all non-US forces must leave Iraq prior to July 31, 2009. As a result, Romania decided to withdraw. Romania formally terminated its mission in Iraq on June 4, 2009, and pulled out its troops. On July 23, 2009 the last Romanian soldiers left Iraq. Three Romanian soldiers had been killed during their mission, and at least eight were wounded. Albania – Albania was one of the first countries participating in the invasion as they sent 70 troops to Iraq in April 2003. Albania increased its deployment from 120 to 240 in September 2008, with the new troops serving in a different, unspecified part of Iraq. Half of the troops were stationed at Mosul airport, where they manned guard towers and conducted internal and external patrols. On December 17, the departure of all 240 Albanian troops, under U.S. command, was announced. Five soldiers were wounded during the deployment. Armenia deployed a total of 46 personnel divided into three units: a logistics platoon providing vehicles and drivers for supply convoys that run from Kuwait into the Polish sector of Iraq, an ordnance disposal engineer team attached to the Salvadoran contingent, and a medical unit at Camp Echo. On December 5, 2005 the Armenian government declared its intention to stay in Iraq for another year, and did the same on December 6, 2006. However, in October 2008, Armenia ended its military presence in Iraq, citing improved security and the ongoing withdrawal of a much larger Polish army contingent that has supervised Armenian troops deployed in the country. Azerbaijan – The original contingent numbered 150 troops, increasing to 250 after an additional 100 were sent on December 29, 2004, before decreasing to 88 by September 2007. They had been stationed in the vicinity of Haditha Dam in western Iraq, providing security for a nearby US Marine camp and patrolling the dam complex. The Azerbaijanis formally terminated their operations and handed over their mission to the Iraqis on December 4, 2008. One soldier, Rafael Seyidbala Agayev, died during the mission due to an unspecified cause. Bosnia and Herzegovina deployed a total of 85 soldiers. This included a unit of 36 troops involved in ordnance disposal in Diwaniyah. In August 2008, Bosnia and Herzegovina sent an additional 49 soldiers to help guard the US Camp Victory in Baghdad. A farewell ceremony for the Bosnian troops was held on November 29, 2008. Bulgaria – Bulgaria withdrew its original contribution of about 485 soldiers in 2005; the unit's objective had been guarding the city centre of Diwaniyah. From March 2006 to late 2008, this unit had guarded the headquarters of the MEK at Camp Ashraf, 100 km west of the Iranian border. This facility is home to 4,000 MEK militants and their weapon stocks. On December 17, 2008 Bulgaria's last 155 troops stationed in Iraq returned home. 13 soldiers were killed during this deployment. At least five Bulgarian contractors were also killed by insurgents. Czech Republic – The original Czech contingent consisted of 300 troops and three civilians running a field hospital, operating under British command Multi-National Division (South-East) (Iraq). After 2006, the goal changed from training Iraqi police to providing Force Protection to Contingency Operation Base (Basrah Air Station) at the vehicle checkpoints. Two thirds of these soldiers were pulled out by late 2007, and 80 out of the remaining 100 were withdrawn in summer 2008 On October 1, 2008 it was announced that the remaining 17 Taji-based Czech troops, who were training Iraqi troops in the use of armoured vehicles, would be withdrawn in December, leaving five troops supporting the NATO Training Mission (NTM-I). On December 4, a ceremony was held marking the end of the Czech mission. One Czech soldier died in May 2003 from injuries sustained in a vehicle accident in Iraq. Georgia – Role of Georgia in the Iraq War: Georgia's contingent originally consisted of 300 special forces troops under U.S. command in Baqouba, who guarded two bridges and three American Forward Operating Bases. 550 more troops were deployed in June 2005, ostensibly to serve as UNAMI guards, although they were placed under U.S. command on a dangerous 'Middle Ring Security' mission in the Green Zone. On March 9, 2007 Georgian President Mikhail Saakashvili announced his plans to increase total Georgian troop strength in Iraq to 2000, by sending an extra 1,200 troops and moving those already in Iraq to join the new unit. Politicians had already stated that the contingent would be reduced to 300 in summer 2008. Following the outbreak of war between Georgia and Russia on August 8, 2008, Mikhail Saakashvili said that Georgia was pulling its entire 2,000-strong contingent of troops from Iraq. During 10 and 11 August the US Air Force airlifted the whole contingent out of Iraq. The troops, all of whom had been trained by American instructors, were based east of Baghdad, close to the border with Iran. As of July 2008, five Georgian soldiers had died in Iraq (one in a vehicle accident, one committed suicide, while three were killed in combat) and 19 were wounded. Kazakhstan – 29 ordnance disposal experts were deployed to Kut, under Polish command. The contingent was withdrawn from Iraq on October 21, 2008, thereby concluding a five-year mission. One soldier was killed in 2005 along with eight Ukrainians when a pile of booby-trapped munitions was detonated by insurgents. South Korea – A farewell ceremony for the remainder of the Irbil-based South Korean contingent was held on December 1, 2008, with its withdrawal from Iraq scheduled for December 5. Total of 20,308 troops had deployed. See Zaytun Division for further information. Latvia – Latvian troops were initially deployed to Kirkuk (under U.S. command) for a year, then transferred to Camp Charlie in Al Hillah, followed by Camp Delta in Al Kut. Finally, the Latvians were stationed at Camp Echo in Ad Diwaniyah where they conducted external security patrols. During their final posting, three Latvian soldiers were killed in action. On June 18, 2007, all but 7 of Latvia's 125 troops left Iraq. Four of the remainder left within two weeks, leaving three officers who participated in intelligence analysis and operational planning from July 2007 onwards. The last three Latvian soldiers concluded their mission on November 8, 2008. Lithuania – Lithuania originally deployed 120 troops to Iraq, approximately 50 under Polish command near Hillah (designation: LITDET), where they guarded Camp Echo; and an equal number under Danish command near Basra (designation: LITCON), where they conducted joint patrols with the Danish troops. The remainder served at various command centers throughout the country. The unit in the Polish sector was withdrawn during the course of 2006. Nine Lithuanian soldiers remain in Iraq under NTM–I. The remaining 33 members of the Lithuanian contingent arrived home on August 1, 2008. Macedonia – 77 soldiers under U.S. command in Taji conducted a wide range of missions including patrols, raids, training, and manning checkpoints. In 2007, it was announced that Macedonia would increase its contingent from 44 to 80 the following year. A farewell ceremony for the Macedonian troops was held on November 26, 2008, with the withdrawal of the contingent scheduled for the second half of December. Moldova – On October 15, 2008 it was announced that Moldova would withdraw its 20-member unit from Iraq before the end of the year. On December 17, the U.S. military announced the withdrawal of the Moldovan contingent. Mongolia – The Mongolians, who originally numbered 180, had operated under Polish command and were tasked with guarding the main Polish base, Camp Echo. Prior to that posting, they had been protecting a logistics base dubbed 'Camp Charlie' in Hillah. All 100 troops were withdrawn on September 25, 2008. Poland – Following Polish involvement in the 2003 invasion of Iraq, 2,500 troops were deployed to the south of the country. Poland led the Multinational Division Central-South. The contingent was reduced in size from 2,500 to 1,500 in 2005. In January 2006 Polish troops handed over control of Babil province to U.S. troops and decided to remain on bases in Kut and Diwaniyah for the remainder of their mandate. Two months later, the number of troops was reduced to 900. These soldiers were pulled out in October 2008, following a dispute between President Lech Kaczyński and newly elected Prime Minister Donald Tusk over how long they should remain in the country. Twenty-two Polish soldiers were killed in Iraq, along with three security personnel and two journalists, one of whom was Waldemar Milewicz, a famous Polish war correspondent. Singapore – In general, Singapore's ships and aircraft return home after two or three months deployment in the Persian Gulf, but there were no ground troops. Singapore's withdrawal was acknowledged on 23 December 2008. Tonga – A separate contingent of 45 Royal Marines had previously operated in Iraq from early July 2004 to mid-December 2004, augmenting the 1st Marine Expeditionary Force by guarding Camp Blue Diamond in Anbar Province. 55 Royal Marines were deployed in late 2007, guarding the command headquarters at Camp Victory in Baghdad. The Tongan unit concluded its mission on December 5. 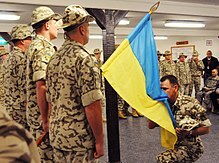 Ukraine – An independent contingent, consisting of 1,650 troops from the 5th Mechanized Brigade, was deployed to Kut (South Central Iraq) in late 2003. In May 2005, the brigade was replaced with the 81st Tactical Group, numbering around 900 troops. A training team of around 40 troops remained in Diwaniyah & Al Kut until December 9, 2008. The deployment was then reduced continuously until the remaining 44 troops were pulled out on December 22, 2005. This fulfilled a long-planned withdrawal pledged by newly elected President Viktor Yushchenko. Ukraine suffered 18 fatalities: twelve in attacks, three in accidents, two in suicides and one as a result of a heart attack, while 33 were wounded or injured. Early in 2004, three Ukrainian engineers were taken hostage in Iraq but were freed shortly after. Denmark – By December 21, 2007 Denmark's main contribution to the Multinational Force in Iraq, a 55-member air force contingent based in Basra, had been completely withdrawn. Their task had been to operate a unit of four helicopters in support of British and Iraqi forces until December, following the withdrawal of the original contingent in July 2007. The so-called Dancon/Irak mission consisted of 430 troops operating under UK command (South-East Iraq), and included military police involved in the training of local security forces as well as infantry. They were based south of Basra at "Camp Danevang". A number of troops remain in Baghdad, Iraq, where they train Iraqi forces under the NATO Training Mission – Iraq, but NTM-I is not part of the Multinational Force. Under the Iraqi Law agreed December 16, 2008 the NATO Training Mission seems to be treated as the remaining non-US foreign contingents and will withdraw during 2009. A separate unit of 35 troops temporarily served under UNAMI. On February 21, 2007 Prime Minister Anders Fogh Rasmussen had announced that the withdrawal of Danish 'combat' troops in Iraq would be completed by August 2007, however, on July 26, 2007, it was reported that 250 of the Danish troops had already withdrawn, at least two weeks ahead of schedule. The Danish government repeatedly guaranteed that its forces would remain as long as the Iraqi government requested. On April 28, 2007 the Danish military reported that it was in the process of temporarily deploying an unspecified number of special forces to "resolve a special problem". Denmark has lost seven soldiers in Iraq; one to friendly fire, one in a vehicle accident, and five to hostile incidents, while several more have been wounded. In early 2006, the Iraqi insurgency released a statement calling for more attacks on the Danish army in the retaliation to the Danish cartoon controversy. Slovakia – On January 27, 2007 Slovak Prime Minister Robert Fico announced that all but 11 of the 110 Slovak troops (primarily engaged in destroying ordnance) operating under the US-led Coalition had been transferred from Diwaniya in Iraq to Kuwait. They arrived home the following month. The remaining troops were sent to perform liaison duties at the Multinational Forces HQ in Baghdad: nine were withdrawn in stages, while the last two returned by the end of the year. Four Slovak soldiers were killed by mortars and roadside bombs during their deployment in Iraq. Italy – The original contingent consisted of about 3,200 troops, but on July 9, 2005, former PM Berlusconi announced that Italian soldiers would gradually be withdrawn in groups of 300. New Prime Minister Romano Prodi had pledged to withdraw the troops in his first speech to the senate and called the war "a grave mistake that has complicated rather than solved the problem of security". Shortly after, on May 26, 2006, Italian foreign minister Massimo D'Alema announced that the Italian forces would be reduced from 1,800 to 1,600 by June. On June 8, he said Italy's military presence in Iraq would end before 2007. On September 21, 2006, Italian forces handed over Dhi Qar province in southern Iraq to newly trained Iraqi security forces, thus ending their military mission. About a month earlier, on August 23, the Italian contingent stood at 1,600 troops. The 'Garibaldi Brigade' served its final four-month tour of duty between May and September 2006, and included mechanized infantry, helicopters and Carabinieri in South Central Iraq, based around Nasiriyah. The Military of Italy lost 33 soldiers in Iraq. See Operation Ancient Babylon for more information. Japan – In early January 2004 600 Japanese soldiers were deployed in Samawah, Iraq in what was called the Japanese Iraq Reconstruction and Support Group. Most Japanese soldiers were there for humanitarian work and reconstruction, not combat, and were prohibited from opening fire on Iraqi insurgents unless fired on first. Japanese Special Forces soldiers and Australian soldiers provided security. Iraqi insurgents also threatened attacks against Japanese soil unless all Japanese forces were withdrawn from Iraq. Incidents like these furthered public demand in Japan that Japan withdraw from Iraq. Insurgents launched several mortar attacks on Japanese positions, but these caused no casualties. In July 2006 all Japanese soldiers were withdrawn from Iraq. There were no Japanese military casualties during the Operation. Norway – 140 of 150 troops (engineers and mine clearers) withdrawn on June 30, 2004 citing growing domestic opposition and the need for the troops elsewhere; the ten remaining staff officers assigned to MND-SE and MND CS had been withdrawn by August 2006. The Bondevik II government insists the troops were never part of the invasion force, citing a UN humanitarian mandate. This does not seem to have come to the attention of the international community, as Al-Qaeda has included Norway in videotaped threats on at least two occasions, and U.S. organizations have included Norway on their lists of participating nations. Netherlands – An independent contingent of 1,345 troops (including 650 Dutch Marines, three or four Chinook helicopters, a military police unit, a logistics team, a commando squad, a field hospital and Royal Netherlands Air Force AH-64 attack helicopters) was deployed to Iraq in 2003, based in Samawah (Southern Iraq). On June 1, 2004 the Dutch government renewed their stay until 2005. The Algemeen Dagblad reported on October 21, 2004 that the Netherlands would pull its troops out of Iraq in March 2005, which it did, leaving half a dozen liaison officers until late 2005. The Netherlands lost two soldiers in separate attacks. Portugal – had 128 military policemen (GNR – Guarda Nacional Republicana) under Italian command (South East Iraq). These troops were withdrawn on February 10, 2005, two days ahead of schedule. Dominican Republic – 302 troops withdrawn by the end of May 2004, shortly after Spain and Honduras withdrew their contingents, citing growing domestic opposition and the fall from power of PRD candidate Hipólito Mejía and the election of center-left PLD candidate Leonel Fernández to the presidency in 2004. The decision to withdraw came just two days after President Mejia promised to keep the troops in Iraq until the expiration of their mandate in August. Dominican troops were under constant mortar attacks but suffered no casualties. While in Iraq, the troops were under Spanish command (South East Iraq). Honduras – 368 troops withdrawn by the end of May 2004 along with Spain's contingent, citing that the troops were sent there for reconstruction, not combat. While in Iraq, the troops were part of the Spanish led Plus Ultra Brigade in South East Iraq. Hungary – Hungary's contingent of 300 transportation troops had begun arriving home in Budapest from Iraq on December 22, 2004, reported by the AFP. All of Hungary's troops were reported by the Defence Ministry to have left Iraq by the end of that day. While in Iraq, one Hungarian soldier was killed in an insurgent attack. Iceland – Iceland had two Explosive Ordnance Disposal Soldiers prior to their withdrawal. New Zealand – Two rotations of 61 military engineers, known as Task Force Rake, operated in Iraq from September 26, 2003 to September 25, 2004. They were deployed to undertake humanitarian and reconstruction tasks consistent with UN Security Council Resolution 1483; they were not part of the invading force. While in Iraq the unit was under British command (South East Iraq) and was based in Basra. Nicaragua – 230 troops left in February 2004, no replacement, attributed to financial reasons. While in Iraq, the troops were under Spanish command. Philippines – 51 medics, engineers and other troops led by Jovito Palparan were withdrawn on July 14, 2004 in response to the kidnapping of a truck driver. When the hostage takers' demands were met (the withdrawal of Filipino troops from Iraq), the hostage was released. While in Iraq, the troops were under Polish command (Central South Iraq). During that time, three Filipino soldiers were wounded in an insurgent attack, although none died. Spain – had 1,300 troops (mostly assigned to policing duties) in Najaf and commanded, through the Plus Ultra Brigade, the troops of Honduras, El Salvador, the Dominican Republic, and of Nicaragua. Newly elected Prime Minister José Luis Rodríguez Zapatero fulfilled one of his campaign pledges and declared the end of the mission on April 28, 2004 with the withdrawal of the last 260 troops. While in Iraq, Spain lost 11 military personnel: ten killed in insurgent attacks and one in an accident. Thailand – Withdrawal of the last 100 troops from Thailand's 423-strong humanitarian contingent was completed on September 10, 2004, in accordance with Thailand's mandate in Iraq, which expired in September. Thailand lost two soldiers in Iraq in an insurgent attack. Canada – According to the U.S. State Department, a total of 15 countries participated covertly. According to classified U.S. documents released by WikiLeaks, despite the Canadian government's official position that they would not participate in the invasion, Canadian officials allegedly promised to clandestinely support it. In addition to naval vessels and personnel already in the region, Canadian officers, Major Generals Peter Devlin and Nicholas Matern, served as Deputy Commanding Generals of Multi-National Corps – Iraq. and Canadian pilots flew Boeing C-17s into Iraq to "season" the flight crews. In 2003, Prime Minister Chrétien admitted that some Canadian troops could be serving alongside American and British troops in Iraq. "It's possible," he said, "but they are not in combat roles." Canadian Defense Minister John McCallum refused to give Parliament details about the locations of Canadian soldiers in Iraq. In early March 2007, Multi-National Force – Iraq announced that it had launched an official YouTube channel for the first time. The channel's videos have over eight million views. The stated purpose of the YouTube channel is to "document action as it appeared to personnel on the ground and in the air as it was shot." The video clips posted to the site are edited for "time, security reasons, and/or overly disturbing or offensive images." Critics of the war have argued that, in addition to direct incentives, the involvement of other members of the coalition was in response for indirect benefits, such as support for North Atlantic Treaty Organization membership or other military and financial aid. Estonian Foreign Minister Urmas Paet, stated in April 2006, that Estonian military forces were to remain in Iraq due to Estonia's "important partnership" with the United States. Many MNF-I member countries had received monetary gain, among other incentives from the United States, in return for their sending of military forces to Iraq, or otherwise supporting coalition forces during the Iraq War. Georgia, is believed to have sent soldiers to Iraq as an act of repayment for the American training of security forces that could potentially be deployed to the break-away regions of South Ossetia and Abkhazia. Indeed, Georgian troops that were sent to Iraq have all undergone these training programs. Turkey was offered approximately $8.5 billion in loans in exchange for sending 10,000 peacekeeping troops in 2003. Even though the United States did say the loans and the sending of troops to Iraq were not directly linked, it also said the loans are contingent upon "cooperation" on Iraq. The Turkish government swiftly rejected all offers of financial aid, and on March 1, 2003, the Turkish Grand National Assembly rejected sending military forces to help participate in the 2003 invasion of Iraq. The decision of the Turkish parliament to do so, at the time, was seen as both a response against American interests in the Middle East, and a desire to keep Turkey out of the Iraq War. The Turkish government, however, allowed all humanitarian flights into and out of Turkey, such as the airlifting of wounded coalition forces. In March 2006, British newspaper, The Independent, reported that companies based within the United Kingdom had received at least £1.1bn in contracts for reconstruction work in post-invasion Iraq. When U.S. forces withdrew in December 2011, 4,804 coalition military personnel had been killed in Iraq. This list, which includes withdrawn countries, lists those deaths. 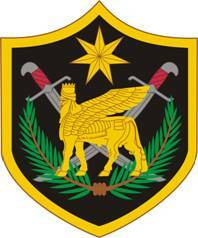 ^ "U.S. ARMY ELEMENT, MULTI-NATIONAL FORCE IRAQ Should Sleeve Insignia". U.S. Army The Institute of Heraldry. Archived from the original on 2017-02-14. Retrieved 2017-02-13. ^ "Deadly Iraq war ends with exit of last U.S. troops – CNN.com". CNN. December 18, 2011. ^ a b Partlow, Joshua (December 8, 2007). "List of 'Willing' U.S. Allies Shrinks Steadily in Iraq". The Washington Post. Retrieved 26 December 2014. ^ Powell, Colin (June 2004). "UNSCR 1546" (PDF). United Nations. United Nations. Archived from the original (PDF) on 2012-09-17. Retrieved 2010-07-22. ^ Bureau of Near Eastern Affairs (4 June 2008). "Iraq Weekly Status Report" (PDF). US Department of State. Archived from the original (PDF) on 14 June 2008. Retrieved 20 December 2015. ^ "UN renews mandate for Iraq troops". BBC News. November 28, 2006. ^ "Security Council, 5808th Meeting" (Press release). United Nations. 2007-12-18. Retrieved 2008-06-12. ^ "Iraq MPs block non-US troop bill". BBC News. 20 December 2008. Retrieved 20 December 2015. ^ "BBC NEWS – Middle East – Iraqi MPs back foreign troop deal". BBC News. December 23, 2008. Retrieved 26 December 2014. ^ a b Erling Borgen (2014-03-24). "Dobbeltmoralske øvelser" [Exercises in double set of morals]. Dagsavisen. Archived from the original on March 24, 2014. ^ "Iraq approves return of small British force". CNN. October 13, 2009. Retrieved 26 December 2014. ^ "UK to pull 800 troops from Iraq". CNN. Archived from the original on 2006-04-20. ^ "Reports: UK to begin withdrawing Iraq troops". CNN. Retrieved May 13, 2010. ^ "Britain to cut troops in Iraq to 2,500 in 2008". International Herald Tribune. The Associated Press. 8 October 2007. Archived from the original on 18 May 2008. Retrieved 20 December 2015. ^ Elizabeth Stewart (April 1, 2008). "Plans to cut UK troops in Iraq put on hold". the Guardian. London. Retrieved 26 December 2014. ^ "UK to start Iraq troop withdrawal by May 31 latest". Euronews. 18 December 2008. Archived from the original on 21 December 2008. Retrieved 20 December 2015. ^ "Brown Says U.K. Forces Will Leave Iraq in 2009 (Update3)". Bloomberg. December 17, 2008. Archived from the original on 21 March 2010. Retrieved 26 December 2014. ^ "Iraq approves draft law for troops withdrawal". Indian Info. IANS. 18 December 2008. Archived from the original on 27 September 2011. Retrieved 20 December 2015. ^ "BBC News – UK's Operation Telic mission in Iraq ends". BBC News. May 22, 2011. Retrieved 26 December 2014. ^ "Barack Obama: All US troops to leave Iraq in 2011". www.bbc.com. October 21, 2011. Retrieved 21 October 2011. ^ Tim Arango; Michael S. Schmidt (18 December 2011). "Last Convoy of American Troops Leaves Iraq". New York Times. Retrieved 13 February 2013. ^ "Last US troops withdraw from Iraq". BBC News. 18 December 2011. Retrieved 13 February 2013. ^ "Iraq in political turmoil hours after last US troops depart". The Daily Telegraph. London. 19 December 2013. Retrieved 13 February 2013. The completion of the US withdrawal on Sunday ended nearly nine years of war, but left many Iraqis fearful that a shaky peace between majority Shi'ites and Sunnis might collapse and reignite sectarian violence. ^ "Rudd makes surprise Iraq visit". The Australian. ^ a b "Australia Withdraws Troops From Iraq". Reuters. June 1, 2008. ^ "Australia ends Iraq troop presence". Express.co.uk. Retrieved 26 December 2014. ^ "Kovco died in 'gun bungle'". The Sydney Morning Herald. December 1, 2006. ^ "iraqupdates.com". Retrieved 26 December 2014. ^ "El Salvador withdraws last soldiers from Iraq". The Jerusalem Post. 7 February 2009. Retrieved 20 December 2015. ^ "No More Estonian Troop Units In Iraq - Defense Ministry". ADVFN. Dow Jones News. 22 January 2009. Retrieved 20 December 2015. ^ "mnf-iraq.com". Retrieved 26 December 2014. ^ John Pike. "Estonian troops may go to Afghanistan, not Iraq". Retrieved 26 December 2014. ^ "USATODAY.com – Coalition in Iraq continues to dwindle". USA Today. May 30, 2006. Retrieved 26 December 2014. ^ "Romania withdrawing troops from Iraq by end of year". Welland Tribune. Tribune Wire Services. 6 November 2008. Retrieved 20 December 2015. ^ "Romania's last contingent in Iraq returns home – People's Daily Online". Retrieved 19 April 2015. ^ William J. Kole. "Coalition losing most non-U.S. troops". The Columbus Dispatch. Archived from the original on 29 July 2012. Retrieved 19 April 2015. ^ "Albania sends more troops to Iraq – People's Daily Online". Retrieved 19 April 2015. ^ a b "Login using your social network". Archived from the original on 2009-03-10. ^ "Write better papers, faster!". Retrieved 26 December 2014. ^ "ARMENIAN PEACEKEEPERS TO STAY AN EXTRA YEAR IN IRAQ". AZG Armenian Daily. 6 December 2005. Archived from the original on 18 March 2007. Retrieved 21 December 2015. ^ "Armenian defense minister to visit Iraq as Armenia is to extend small troop presence". Associated Press. November 13, 2006. Archived from the original on 7 April 2012. Retrieved 2007-02-20. ^ "Armenia Ends Iraq Mission". Yerevan (RFE/RL). October 15, 2008. Retrieved 2008-10-17. ^ "Iraq: As Third-Largest Contingent, Georgia Hopes To Show Its Worth". RadioFreeEurope/RadioLiberty. Retrieved 19 April 2015. ^ "Azerbaijani troops end mission in Iraq". Archived from the original on 2009-08-09. ^ a b "Login". Retrieved 26 December 2014. ^ John Pike. "Mujahedin-e Khalq Organization (MEK or MKO)". Retrieved 19 April 2015. ^ "Last Bulgarian Troops Return from Iraq". Balkan Insight. 18 December 2008. Retrieved 21 December 2015. ^ "Parliament approves withdrawal of most Czech troops from Iraq in 2008". International Herald Tribune. The Associated Press. 5 December 2007. Archived from the original on 18 May 2008. Retrieved 21 December 2015. ^ "Czechs to withdraw most of its troops from Iraq". International Herald Tribune. The Associated Press. 1 October 2008. Archived from the original on 2 December 2008. Retrieved 21 December 2015. ^ John Pike. "Czech Republic Army marks end of mission". Retrieved 26 December 2014. ^ Collin, Matthew (March 9, 2007). "Georgia to double troops in Iraq". BBC News. Retrieved May 13, 2010. ^ Partlow, Joshua (December 8, 2007). "List of 'Willing' U.S. Allies Shrinks Steadily in Iraq". The Washington Post. Retrieved May 13, 2010. ^ "Peace bid as Ossetia crisis rages". BBC. 2008-08-09. Retrieved 2008-08-09. ^ "U.S. takes Georgian troops home from Iraq". Air Force Times. 2008-08-11. Retrieved 2008-08-12. ^ Kramer, Andrew E. (October 9, 2007). "Russia on Its Mind, Georgia Flexes Its Muscle in Iraq". The New York Times. Retrieved May 13, 2010. ^ Golovnina, Maria (21 October 2008). "Kazakhstan withdraws soldiers from Iraq". Reuters. ASTANA. Retrieved 21 December 2015. ^ "mnf-iraq.com". Archived from the original on September 4, 2009. Retrieved 26 December 2014. ^ "Ministry of National Defence Republic of Lithuania". Retrieved 26 December 2014. ^ Thomson Reuters Foundation. "Thomson Reuters Foundation". Retrieved 19 April 2015. ^ Thomson Reuters Foundation. "Thomson Reuters Foundation". Retrieved 26 December 2014. ^ "POLAND: It's Hard Saying Even Goodbye to Iraq". Archived from the original on February 20, 2012. Retrieved 19 April 2015. ^ "SAF's LST Returns from Middle East". MINDEF. Archived from the original on 2012-08-05. Retrieved 2007-04-21. ^ "SAF C-130 Aircraft Returns from the Gulf". MINDEF. Archived from the original on 2012-08-05. Retrieved 2007-04-21. ^ "SAF KC-135 Returns from Gulf". MINDEF. Archived from the original on 2012-08-04. Retrieved 2007-04-21. ^ "SAF LST Returns from Persian Gulf". MINDEF. Archived from the original on 2012-08-05. Retrieved 2007-04-21. ^ "SAF KC-135 Aircraft Returns from the Gulf". MINDEF. Archived from the original on 2012-08-05. Retrieved 2007-04-21. ^ "SAF Ship Returns from Persian Gulf". MINDEF. Archived from the original on 2012-08-05. Retrieved 2007-04-21. ^ "Tonga". U.S. Department of State. Retrieved 19 April 2015. ^ "Tonga troops prepare for Iraq duty – The Honolulu Advertiser – Hawaii's Newspaper". Retrieved 19 April 2015. ^ Rubin, Alissa J. (December 6, 2008). "Troop Pullout to Leave U.S. and Britain as Iraq Force". The New York Times. Retrieved 26 December 2014. ^ "У Миколаєві відбувся благодійний футбольний матч "Кубок миру" на підтримку Українського війська". Міністерство оборони України. Retrieved 19 April 2015. ^ Sgt. Rodney Foliente (11 December 2008). "Ukrainians complete mission in Iraq". Retrieved 26 December 2014. ^ "U.S. allies withdraw from Iraq". Archived from the original on 2005-12-29. ^ "Ukraine withdraws last troops in Iraq". ReliefWeb. Retrieved 26 December 2014. ^ The Copenhagen Post. "Wars may force budget alterations". jyllands-posten.dk. Archived from the original on October 7, 2015. ^ "World news and comment from the Guardian – The Guardian". the Guardian. London. Retrieved 19 April 2015. ^ "FOCUS Information Agency". FOCUS Information Agency. Retrieved 19 April 2015. ^ "DefenseNews.com – Denmark: We're Staying the Course in Iraq – 12/05/05 13:24". Retrieved 19 April 2015. ^ Sturcke, James (May 18, 2006). "Prodi condemns Iraq war as 'grave mistake'". The Guardian. London. Retrieved May 13, 2010. ^ "Italy pledges commitment to Iraq". CNN. Reuters. Archived from the original on 2006-06-16. Retrieved 21 December 2015. ^ "Dominican Republic to Pull Iraq Troops Early". Fox News. April 20, 2004. Retrieved 26 December 2014. ^ Spencer C. Tucker (14 December 2015). U.S. Conflicts in the 21st Century: Afghanistan War, Iraq War, and the War on Terror [3 volumes]: Afghanistan War, Iraq War, and the War on Terror. ABC-CLIO. p. 423. ISBN 978-1-4408-3879-8. ^ "FAQs Re Light Engineer Group To Iraq". Retrieved 26 December 2014. ^ "Filipino Hostage Freed In Baghdad". CBS News. 21 July 2004. Retrieved 26 December 2014. ^ Steve Schifferes (March 18, 2003). "US names 'coalition of the willing'". BBC News. ^ a b Greg Weston (May 16, 2011). "Canada offered to aid Iraq invasion: WikiLeaks". CBC News. Archived from the original on July 23, 2014. ^ Jon Elmer and Anthony Fenton (January 25, 2008). "Canadian General Takes Senior Command Role in Iraq". Global Research. ^ "Canadian pilots flew missions in Iraq". Canada.com/The Ottawa Citizen. April 22, 2008. Archived from the original on August 30, 2013. ^ "PM says 'it's possible' Canadian soldiers in Iraq". CBC News. April 4, 2003. ^ "Coalition operations on YouTube". Multi-National Force – Iraq. March 17, 2007. Archived from the original on September 11, 2009. ^ Multi-National Force – Iraq. YouTube. Retrieved 19 April 2015. ^ Smith-Spark, Laura (May 11, 2007). "US military takes Iraq war to YouTube". BBC News. ^ "DefenseNews.com – Estonia Should Keep Troops in Iraq in 2007: Official – 04/21/06 12:06". Retrieved 19 April 2015. ^ "US Pays Back Nations That Supported War – UN Security Council". Global Policy Forum. ^ "U.S. quietly puts down roots in Georgia". csmonitor.com. ^ "U.S. Army Europe to train more Georgian troops". Stars and Stripes. June 27, 2006. ^ "Turks pitch in: new troops to Iraq". Christian Science Monitor. ^ Verkaik, Robert (March 13, 2006). "The War Dividend: The British companies making a fortune out of conflict-riven Iraq". The Independent. London. Archived from the original on July 8, 2008. Retrieved May 13, 2010. ^ iCasualties. "Operation Iraqi Freedom". iCasualties. iCasualties. Retrieved February 14, 2014. ^ iCasualties. "United States". iCasualties. iCasualties. Retrieved February 14, 2014. ^ iCasualties. "United Kingdom". iCasualties. iCasualties. Retrieved February 14, 2014. ^ iCasualties. "Italy". iCasualties. iCasualties. Retrieved February 14, 2014. ^ iCasualties. "Poland". iCasualties. iCasualties. Retrieved February 14, 2014. ^ iCasualties. "Ukraine". iCasualties. iCasualties. Retrieved February 14, 2014. ^ iCasualties. "Bulgaria". iCasualties. iCasualties. Retrieved February 14, 2014. ^ iCasualties. "Spain". iCasualties. iCasualties. Retrieved February 14, 2014. ^ iCasualties. "Denmark". iCasualties. iCasualties. Retrieved February 14, 2014. ^ iCasualties. "El Salvador". iCasualties. iCasualties. Retrieved February 14, 2014. ^ iCasualties. "Georgia". iCasualties. iCasualties. Retrieved February 14, 2014. ^ iCasualties. "Slovakia". iCasualties. iCasualties. Retrieved February 14, 2014. ^ iCasualties. "Latvia". iCasualties. iCasualties. Retrieved February 14, 2014. ^ iCasualties. "Romania". iCasualties. iCasualties. Retrieved February 14, 2014. ^ iCasualties. "Estonia". iCasualties. iCasualties. Retrieved February 14, 2014. ^ iCasualties. "Thailand". iCasualties. iCasualties. Retrieved February 14, 2014. ^ iCasualties. "Australia". iCasualties. iCasualties. Retrieved February 14, 2014. ^ iCasualties. "Netherlands". iCasualties. iCasualties. Retrieved February 14, 2014. ^ iCasualties. "Kazakhstan". iCasualties. iCasualties. Retrieved February 14, 2014. ^ iCasualties. "South Korea". iCasualties. iCasualties. Retrieved February 14, 2014. ^ iCasualties. "Hungary". iCasualties. iCasualties. Retrieved February 14, 2014. ^ iCasualties. "Czech Republic". iCasualties. iCasualties. Retrieved February 14, 2014. ^ iCasualties. "Azerbaijan". iCasualties. iCasualties. Retrieved February 14, 2014. Carney, Stephen A. (2011). Allied Participation in Operation Iraqi Freedom (PDF). Washington D.C.: Center of Military History, United States Army. ISBN 978-0-16-086694-4. Multi-national troop deployments: Raw data, graphs and rankings, Collected from various news sources.